After 85 years of service, Marian Community Hospital in Carbondale, Pennsylvania, closed its doors on February 28th, 2012. The hospital employed 200 people in this small community of 14,000 located in Lackawanna County. This hospital did not close because there is a lack of healthcare need in Carbondale. The Health Resources and Services Administration currently classifies Lackawanna County as medically underserved and Stratasan predicts there will be 69,354 hospital visits in Carbondale this year. Marian Community Hospital is a part of a growing trend in America: hospital closures in spite of a growing need for healthcare. Hospitals need access to healthcare data to understand their patient population and to provide the specific services needed in the unique communities they serve. However, the world of healthcare data is a complicated web on which few people are experts. In addition to countless federal datasets available through Medicare, the CDC, HCUP, and others, most states also operate their own health data collection and distribution system. Costs range from as little as a few hundred dollars per dataset to $60,000 per dataset per year. To help navigate the complicated world of healthcare data, Stratasan will post the expected data releases each month. 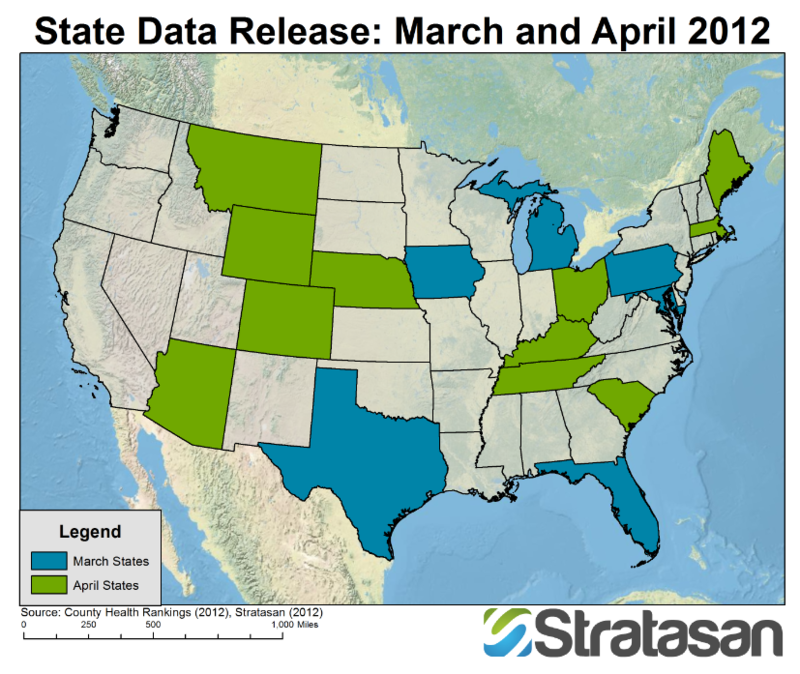 This map shows the states with planned data releases for March and April. The first step in making data-driven healthcare decisions is knowing what data resources are available. At Stratasan, our goal is to put the right information in the hands of hospitals and healthcare professionals to insure they can continue to deliver the services needed in their communities. To gain better perspective on America’s data landscape, check back with us at the start of every month to see what states are releasing data.